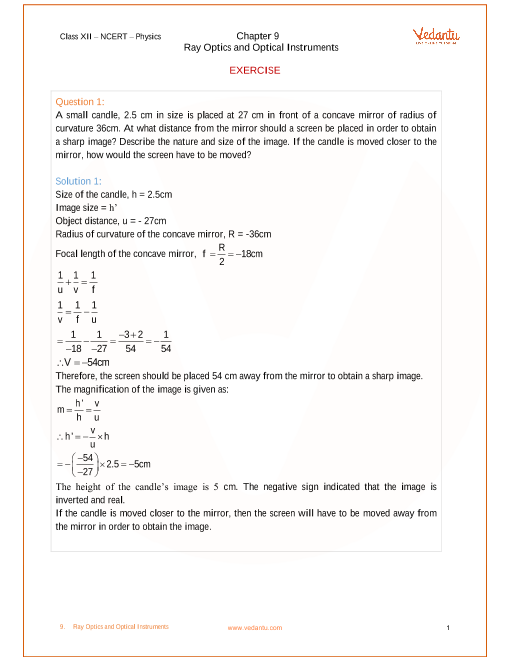 Vedantu.com - No.1 online tutoring company in India provides you Free PDF download of NCERT Solutions for Class 12 Physics Chapter 9 - Ray Optics and Optical Instruments solved by Expert Teachers as per NCERT (CBSE) Book guidelines. All Chapter 9 - Ray Optics and Optical Instruments Exercise Questions with Solutions to help you to revise complete Syllabus and Score More marks. Register for online coaching for IIT JEE (Mains & Advanced), NEET, Engineering and Medical entrance exams. NCERT Grade 12 Physics Part 2 begins with Chapter 9, Ray Optics and Optical Instruments. This is a part of Unit 6, Optics. One of the most important Units of NCERT Grade 12 Physics; Optics holds a total weightage of 14 marks in the final examination. In this chapter, the phenomena of reflection, refraction and dispersion of light, using the ray picture of light is considered. Using the basic laws of reflection and refraction, students shall study the image formation by plane and spherical reflecting and refracting surfaces. They will learn to describe the construction and working of some important optical instruments, including the human eye. Introduction to Ray Optics, Reflection of Light by Spherical Mirrors, Sign convention, Focal length of spherical mirrors, The mirror equation, Refraction, Total Internal Reflection, Total internal reflection in nature and its technological applications, Refraction at Spherical Surfaces and by Lenses, Refraction at a spherical surface, Refraction by a lens, Power of a lens, Combination of thin lenses in contact, Refraction Through a Prism, Dispersion by a Prism, Some Natural Phenomena due to Sunlight, The rainbow, Scattering of light, Optical Instruments, The eye, The microscope and Telescope are the topics studied through this chapter. Ray diagrams, graphs, illustrations and examples associated to daily life make this chapter very interesting and easy to learn. Solved numeral problems and unsolved ones for practice make the students understand the concept better and develop a strong grip on the subject. The contribution of eminent scientists such as Newton and others in the field of Ray Optics has helped to develop laws on the topic that the students shall study through this chapter. Detailed derivations to help derive formulas and equations will aid to solve the problems and understand the concepts. Get 100 percent accurate NCERT Solutions for Class 12 Physics Chapter 9 (Ray Optics and Optical Instruments) solved by expert Physics teachers. We provide solutions for questions given in Class 12 Physics text-book as per CBSE Board guidelines from the latest NCERT book for Class 12 Physics. The topics and sub-topics in Chapter 9 Ray Optics and Optical Instruments are given below. Chapter 9 Exercises - 37 Questions with Solutions. Other than given exercises, you should also practice all the solved examples given in the book to clear your concepts on Ray Optics and Optical Instruments. Download the free PDF of Chapter 9 Ray Optics and Optical Instruments and take the print out to keep it handy for your exam preparation.